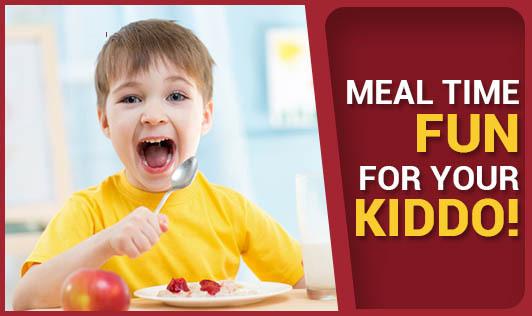 Meal Time Fun for Your Kiddo! Is your child not eating well? This is because your toddler is in the midst of developing his personality and individual preferences. So to keep your child interested you need to create some fun at meal! • Include your child in the family meals and make them feel like a family member. They will be able to emulate and learn by watching the other family members. • Give them separate attractive bowls and cutleries. Allow them to feed themselves as soon as they are able to handle smaller pieces of food. This encourages them to eat independently. • Accept and ignore the mess at mealtime. That is how kids learn. If you scold the kid every time the food is dropped on the floor, mealtimes will definitely be a miserable time for you as well as the kid. Smile and cheer up instantly. Babies will feel encouraged and will be eager to please you. • As children grow they love to be independent. They like to try different things on their own. Give them the chance to serve food for themselves (with assistance). • Offer small portions instead of piling a huge portion of food. At the same time, you teach them simple etiquettes like being patient until everyone's food has been served; avoid talking while eating or even make noises while chewing food. • Don't forget to appreciate when they have finished eating everything on the plate. This will give them a sense of accomplishment and encourage them to take a second offering. • Make sure that there are no distractions. Let your meal time be a family time where you all can chat together. • Do not use toys to distract your child while eating. Make children learn that meal times are for eating and not playing. Instead, make them understand the functions of food and how it helps them grow tall and strong! You can give them examples like carrots being good for their eyes. At the same time you could teach them different colors associated with these vegetables. Another example would be milk and its function in healthy teeth and bones. • Make the food look attractive by using a lot of different color combinations. You could also simply arrange it in different shapes. Your creativity will make a lot of difference to the child's appetite. • Do not forget to reward your child for eating well- but do not give candies or chocolates as gifts. You can give stickers or simply spend some time playing your child's favorite game. Make meal time fun and entertaining for your kids so they look forward to it!